In a recent email I highly recommend the Michael Garman Museum/Gallery as a must see in Colorado Springs. Garman is a genius who developed Magic Town that presents 26 buildings and 300 human figures in a fantastic neighborhood block. It’s a sculptured exhibit in two rooms, with a total space of approximately 3,000 feet. Visitors view common people in such settings as hotels, on the street, bars and restaurants, even a television appliance shop. Through holograms and hidden mirrors scenes change. The exhibit is not just people and structures. 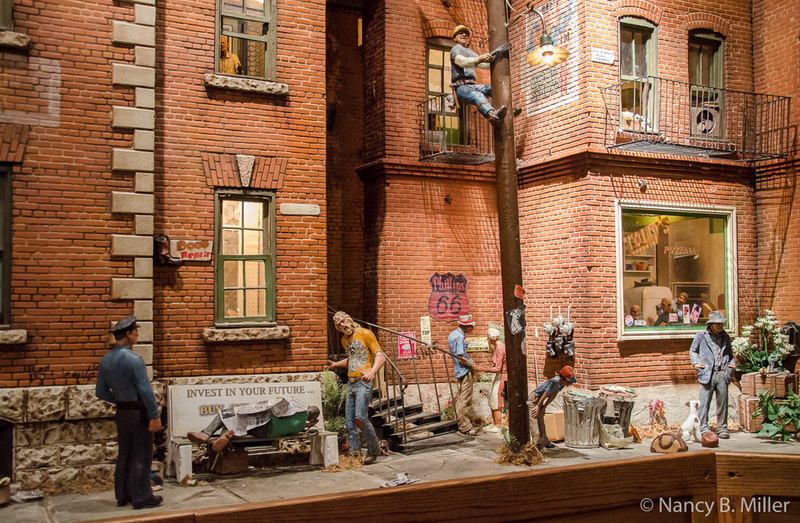 It has close to 1,000 dogs, cats, and squirrels and more than 1,000 light bulbs. Figures are 1/6 life size, usually twelve inches. Pieces in both 12 and 9 inches in scale as well as larger pieces over 20 inches in height (Pathfinder, Saddle Tramp, Rescue Company, and others) are available for sale in the gift shop. On Tuesday, Mary Koehler, director of public relations for Michael Garman Museum/Gallery, gave Earl and me a behind the scenes tour of this facility and an opportunity to see how all is created. Garman believes the common man, not just gallery collectors, should enjoy his art so he makes his figures affordable. He believes his figures tell stories and that a part of these stories is lost when he sells originals. Therefore, he creates reproductions of his figures. These are the ones he sells in his gallery. 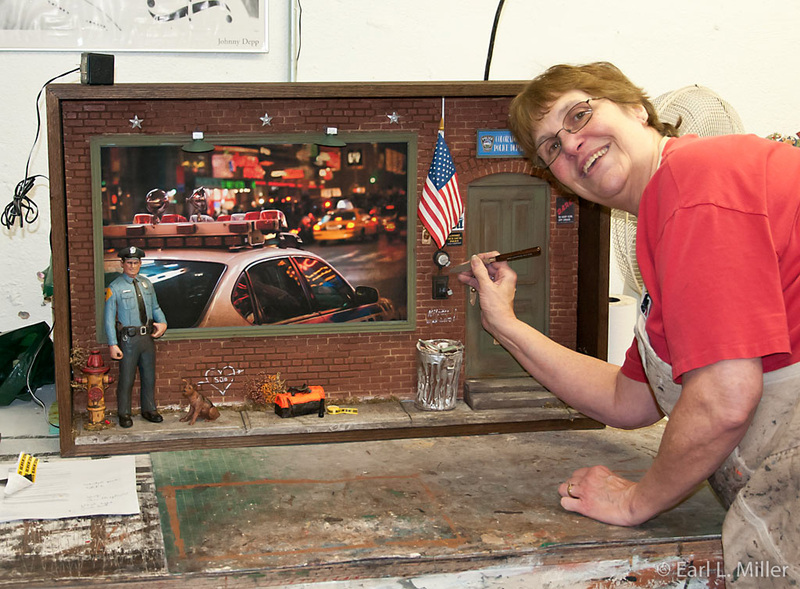 Original sculptures find a home in Magic Town. All sculptures are first made by Garman. The master is made of sculptor wax. A mold can cost $10,000. Depending on the sculpture’s size, a mold can last 20 years. Copies are made from hydrocal-gypsum and marble dust. Hydrocal goop is a mixture thicker than resin. Resin is essential for thin pieces but it is more expensive than hyrocal. Since hydrocal flows upside down, this is how Michael imagines his figures. Keys are placed in all of the figure’s openings to allow spaces. The more gaps, the more keys, and the higher the figure’s price. One piece - Rendezvous - has 30 spaces. His Highwayman and Drifter were also difficult sculptures to make. Staff makes all the characters. For example, squirrels are molded and painted. 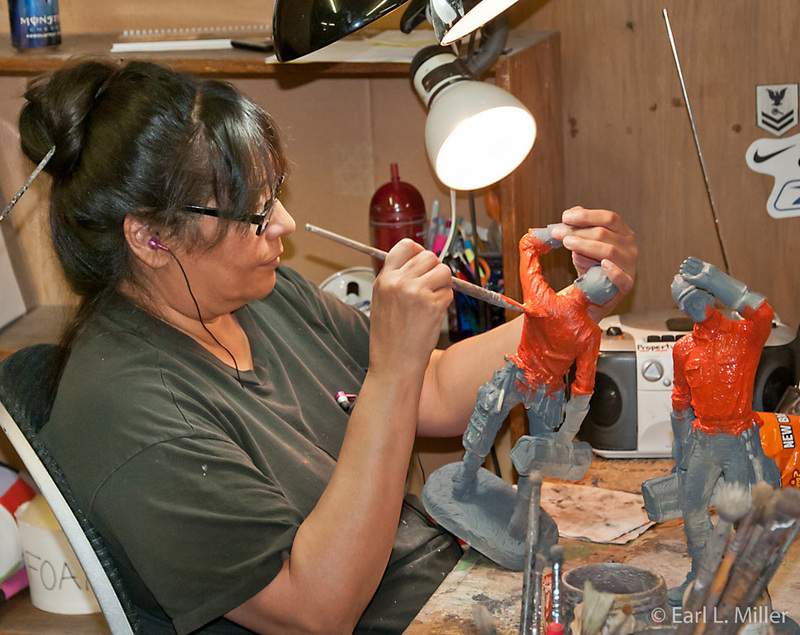 Employees work on painting a character for one to four hours. They dip bronze figures in chocolate paint then brush the bronze on. Only two solid bronzes have been made in a limited edition of 1,000 pieces. True bronzes are much costlier - $2500 while bronze painted figures sell for $250 or less. Originally Michael’s pieces like the tugboat captain were smoother, more cartoonish, and had more exaggerated faces. He then began to embrace more realism like his River Pilot. His Saddle Tramp appeared in many ads. It costs $449. It took four editions to get it right. These ranged from too small hands and feet on the first edition to a small face where the figure looked down on the second. The trademark was his fourth. One major figure, “Our Flag Was Still There,” was made in 2002 in response to September 11. In 2005, his supply fell to ten pieces, and he stopped selling his featured piece. He rebuilt the figure for 2011. Michael started to build scenes in 1971-75. He constructed 157 rooms in the back room at a cost of a million dollars. He promoted everything from the money made by his Western Series characters. In 1971, Michael moved to Colorado Springs. Prior to that, he had spent time in San Francisco doing theater and in Philadelphia studying characters and architecture. He couldn’t seem to interest others in his product. He couldn’t borrow money from any of the banks even though his gallery was the cornerstone of Old Colorado Springs. In 2008, Michael learned he had congestive heart failure. The Michael Garman Gallery staff thought they might have to close the company permanently. Word of his retirement leaked out creating a flood of interest. At Christmas time, Michael said he couldn’t leave even if it meant he died at the museum. At that time, he planned to convert his gallery to a museum. He reduced his staff. He brought all of his pieces out of retirement and made them available. Scenes were made in bits and pieces in his apartment on the third floor. He brought in a man with two sons from Seattle to assist him. They refurbished his characters and brought them to life. As mentioned, Garman uses holograms and mirrors in his Magic Town. Holograms are in the alleys and some of the windows. Some of the holograms, i. e. , the couple near the movie theater, speak. Everything prior to the holograms in the 1980's was VHS while in the 1990's, DVDs. But first, he used 8 millimeter film. They have now refilmed everything in HD. The museum/gallery reopened in 2009 on Michael’s 75th birthday. They put in track lighting and made changes to characters. One setting “City Life” has been on the Tonight Show and the Today Show. Look for it as you tour the museum since it’s on display. Another trick is to bend mirrors. This makes people think they are seeing other scenes but it’s really mirrors and holograms. For example, the Global Mae House has two trick lighting machines. Look in one window and you’ll see a self portrait of Michael. The original street scene was Darby One. It was displayed at an art show where a provision was he couldn’t reproduce his scene. He won the show with it. A gentleman wanted to buy it but tore up his check in front of Michael when Michael said he had made three more. You’ll spot some of the same characters in different scenes. For example, Spence, a wino, is seen at Darby when he is looking his best. Later he has a liquor bottle. Mischief, a teenage boy	is seen talking to a girl, watching the men in the manhole, and watching guys playing craps. There are different kinds of winos: the philosopher who is making decisions, ones who just exist, and the happy go lucky. Passing Through Wino is a sorry looking character but the most hopeful of all. He is passing through and not sure where he’ll spend his day. At one time, Michel was an alcoholic. While in San Francisco, he was open to anything and developed more characters than in Philadelphia. Passing Through Wino captured Michael’s spirit. Michael only has made four ladies for Magic Town though a few are viewed in more than one scene. His women are the barmaid, sweeper, waitress, and housewife. He doesn’t make more kinds of women because he feels he doesn’t get them right. Michael doesn’t make beautiful characters. He just wants them to tell stories. Characters are meant to be those from Michael’s entire life. The oldest represent the year 1939. He has created a lot of characters from the 1940's and 1950's. His representation of the 90's is a tattooed couple. Buildings are made from blown foam allowing them to be lightweight and easy to move. Michael is not the only family member with sculptures in Magic Town. His son at age thirteen sculpted a gorilla which presently resides in a window. He also created a clown, mummy, and a lot of the military figures. His son no longer works with him, but his youngest daughter does. Bernie, the dog, was commissioned by State Farm. It belonged to the insurance company for ten years but can now be sold. You can purchase Bernies associated with many holidays. They are currently retiring a few Bernies but will keep Halloween, Thanksgiving, and Christmas. Mary walked Earl and me behind the scenes to see where the televisions were. They’re facing down. This is where the holograms are located. A sound track exists for sirens, animals, and a train. All DVDs back each other up. They’re trained to repeat. Some last 30 seconds; others run for two minutes. Holograms are blue-screen with couples fading away when they are lit up. Props are also poured and painted. In the basement, we saw boxes of phones, tools, boxes, fire hydrants, purses, and pool balls. We had the pleasure of meeting Michael again. The respect Earl and I have for him and this man’s work have made our two visits to his museum/gallery among the highlights of our visit to Colorado Springs. We purchased one of his sculptures and look forward to seeing it daily in our home. It will create many happy memories.